I'm Always Mentally on Vacation: A Breakthrough! I may have cracked my pizza crust dilemma. As you recall, I was making pizzas that were fantastic tasting, looked great, but the crust left something to be desired. Plus it was a hell of a lot of trouble making dough that turned out substandard. And darn time consuming and messy too. I like pizza crust, but I don’t want the crust to define the pizza. I simply want my crust to be a delivery agent for the stuff on top. It needs a few characteristics, good mouth feel, thin and not over powering, eye appeal, able to roll for the maximum mouth shove. For the pizza perfectionists out there my solution for now may be the “instant grits” of fixes, but I was surprised how good this was. 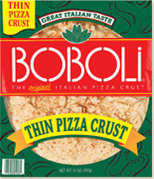 I bought a couple of premade Boboli pizza crusts and the results were very good. It allowed me to get beyond my stumbling block and get on with a good pizza. They slide nicely on and off the pizza stone and browned up evenly. I made one last week and Gigi and I went all Hoover on it. I still have burns healing on the roof of my mouth. The crusts were a bit pricey at $5 each but I found another source at Costco for 5 for $5. So I think now the technology will allow me to take this pizza show on the road and maybe tailgating on Sunday. You are the James Bond of pizza. I've seen these at the store. Never thought to buy one. I've used those Pillsbury refrigerated ones that you just roll out, and they're not bad.